heterotrophic and autotrophic eukaryotes preserved in chert and carbonate from the Kingston Peak Formation in the western US. The biota occurs in Sturtian glacial deposits but is comparable to the biota in underlying preglacial rocks. This is a particularly interesting deposit, in that the diversity within the biota does not suggest merely a few "disaster" taxa but rather a complex community with several trophic levels. Z. Zhou et al. (2007) examined the stratigraphic distribution of the acritarch biotas that are typical of both the Pertatataka Formation in Australia and the Doushantuo Formation in South China. Specifically, using chemostratig-raphy and biostratigraphy, they detailed first appearances of this assemblage with regard to Neoproterozoic glaciations. Their research suggests that this biota appeared immediately after glaciation in the East Yangtze Gorges area; its appearance at Weng'an, however, cannot be correlated with a glaciation event. Interestingly, acritarch biozonation in Australia places the first appearance of acanthomorphic species immediately after the Acraman impact (~580Ma), and this has led some to suggest that this event may have triggered subsequent eukaryotic diversification (Grey et al., 2003; Willman et al., 2006). It appears that more data are needed from both paleo-botany and geochronology before the evolution of these acri-tarch biotas can be confidently correlated with glaciations or other environmental perturbations. The fossil record from the Neoproterozoic is the most complete in the Precambrian, and correlations between particular biotas and their paleoenvironments can be discerned with much higher resolution (Knoll et al., 1989). Planktonic microfossils show an inshore—offshore pattern, as they do today, with biotas from inshore deposits typically exhibiting low diversity and dominance by one or two taxa. Open-shelf assemblages, however, are much more diverse and the individuals are more complex (Vidal and Knoll, 1983). Three different assemblages of microorganisms were described from the Rysso Formation of Svalbard, Spitsbergen (Knoll and Calder, 1983). One assemblage consists of typical stromatolitic microorganisms. Another represents an open coastal environment and is dominated by planktonic forms such as acritarchs, and the third contains a large number of vase-shaped protists. The occurrence of these three micro-biotas within a single formation provides a unique opportunity to evaluate organisms from three very different habitats and to develop a more complete picture of life from 800 to 700 Ma. Although much of our information on Precambrian organisms has come from structurally preserved fossils in chert deposits, more and more data are available on compressed organisms from other paleoenvironments than those represented by chert biotas. Knoll and Swett (1985) described a series of biotas from Spitsbergen which include unicellular and filamentous prokaryotes preserved in shales. They are able to compare these organisms to those found in the Bitter Springs chert and to slightly younger, silicified biotas from Svalbard. Butterfield et al. (1988) described a well-preserved fossil biota recovered from subtidal marine shales of the Neoproterozoic of Spitsbergen (800-700 Ma). 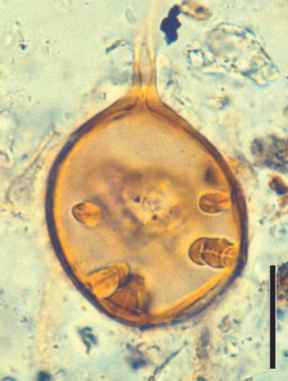 This biota includes sphaeromorphic acritarchs, eukaryotic multicel-lular algae comparable to extant Ulvophyceae, cyanobacte-rial sheaths, rod-shaped and filamentous forms similar to heterotrophic bacteria, and what appear to be germinating zoospores of filamentous protists. Other forms that were present in this biota have been interpreted as allochthonous (i.e., not preserved in situ). These include Chuaria, Tawuia, and a number of morphologically complex acritarchs. Some of the more interesting forms include large vesicles (150250 pm in diameter) with long, terminally flared processes. These structures have been interpreted as encystment structures. This interpretation is supported by their occasional occurrence within even larger forms (300 pm in diameter). Xiao et al. (2002) proposed that there are only 20 taxa present, although more than 100 have been described. Of these, eight taxa are definitely eukaryotic algae, nine represent possible algae, and two taxa are cyanobacteria. The biota includes coenocytic green algae and thalli comparable to members of the Rhodophyta (red algae) and Phaeophyceae (brown algae; Chapter 4). This biota occurs immediately after the Marinoan glaciation and just prior to the appearance of the metazoan Ediacaran fauna, but there appear to be no metazoans in this compressed biota. Algae, including acritarchs, are also preserved as three-dimensional phosphatized remains in the Doushantuo. Xiao et al. (2002, 2004) reported on exceptionally well-preserved, multi-cellular and pseudoparenchymatous red algae, as well as cell division in algal cells. These, along with other Neoproterozoic algae, are described in more detail in Chapter 4.